While the hype continues to swirl around the likes of James Harden and Giannis Antetokounmpo in MVP talks, another player is starting to emerge from the fray. The Thunder's Paul George has been on a tear, most recently dropping 40-plus points in back-to-back games against the Rockets and Trail Blazers, including a triple-double Monday against the Blazers. "Absolutely, I mean we are tied -- maybe third seed whatever -- but the way he's playing [is] consistent," said Westbrook, per ESPN's Royce Young. 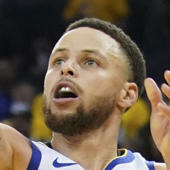 "...I think a lot of people around the world that don't play basketball, that don't play sports, don't understand what it takes to be consistent and get your mind right every night to be able to do something, so for him to do that and stay on the path to do that, he's definitely the front-runner for my MVP," Westbrook continued. Westbrook's consistency in the 2016-17 season was legendary when he averaged a triple-double throughout the season. George also made believers out of the Blazers' key players with his game. "He's on a different level. I mean, after watching him over the last 10 games or so, I catch a lot of their games, and then seeing him tonight, man, that dude is… He is MVP," Damian Lillard said, per NBC Sports Northwest. "If they keep this up, he is MVP." "It was unreal," Evan Turner said. "I know everybody is going crazy for Giannis and James, but everybody I probably went up against, and no disrespect for the other two because they're unbelievable, but Paul is the best we've probably went up against all year." "He's at a completely different level. It's hard to even explain," Turner added. The Thunder as a team are playing some unbelievable basketball. Westbrook netted his 10th straight triple-double on Monday, and they look like contenders. When George re-signed with the Thunder, there was some surprise around the NBA, but he's more than silenced any doubters of that signing. George and Westbrook are coexisting as well as any superstar duo in basketball right now, and they can continue to climb in the standings with their upcoming schedule, they'll be back on the floor on Thursday night when they travel to New Orleans (8 p.m. ET -- Watch on FuboTV with NBA League Pass add-on). Their next several games are against the Pelicans, Jazz and Kings before they get into a big showdown with the Nuggets. If George keeps playing at the level he's been playing at -- complemented by Westbrook's outstanding streak -- the Thunder are going to continue to be a problem in the West.